In seventeenth-century France, aristocratic women were valued by their families as commodities to be married off in exchange for money, social advantage, or military alliance. Once married, they became legally subservient to their husbands. The duchesse de Montpensier—a first cousin of Louis XIV—was one of very few exceptions, thanks to the vast wealth she inherited from her mother, who died shortly after Montpensier was born. She was also one of the few politically powerful women in France at the time to have been an accomplished writer. In the daring letters presented in this bilingual edition, Montpensier condemns the alliance system of marriage, proposing instead to found a republic that she would govern, "a corner of the world in which . . . women are their own mistresses," and where marriage and even courtship would be outlawed. Her pastoral utopia would provide medical care and vocational training for the poor, and all the homes would have libraries and studies, so that each woman would have a "room of her own" in which to write books. 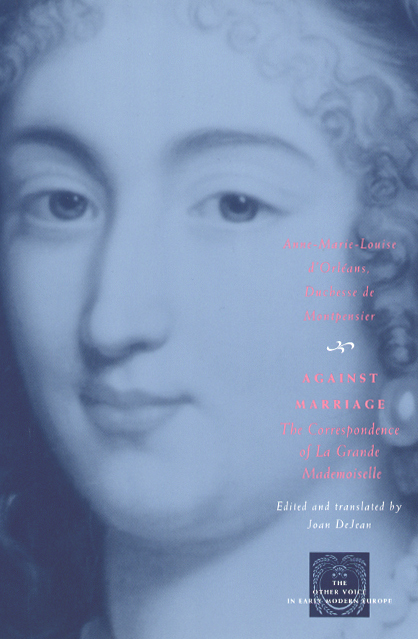 Joan DeJean’s lively introduction and accessible translation of Montpensier’s letters—four previously unpublished—allow us unprecedented access to the courageous voice of this extraordinary woman. "Famous during her lifetime, a leading figure in the insurrection known as the Fronde, and France’s richest woman, La Grande Mademoiselle was also a writer of considerable ability; she brings to her memoirs the unique double perspective of a woman and an insider, and they provide a rare portrait of aristocratic life during the most tumultuous and dazzling decades of the century."